Like most things Voynich, these "rainbows" look rather strange. They consist of four or five bands, one colored blue and another green. They are not tube-like, distinguishing them from similar bows in the MS. So well, I wonder, could these actually represent rainbows? Has anyone found comparative images? I started this thread because I saw this rainbow in the Wiener Genesis, which reminded me of the VM style. But that's all I've got for now. Great idea to start thihs thread Koen Gh! All I've got for now is that Isidore, in De Rerum Natura, describes rainbows as having four colors, in accordance with the four elements. Also I seem to remember that rainbows are often present in Apocalypse manuscripts, but no references for now, sorry! (08-12-2016, 11:37 AM)VViews Wrote: You are not allowed to view links. Register or Login to view. All I've got for now is that Isidore, in De Rerum Natura, describes rainbows as having four colors, in accordance with the four elements. That's an interesting bit of information, might explain the somewhat limited palette we see in both manuscripts. If you look really closely, you see that in the VM the band between green and blue is some faded yellowish color. Also in the other MS, the green seems to flow towards yellow. Though in both cases we must be cautious since the colors we see now may have shifted or faded. (08-12-2016, 01:03 PM)Koen Gh. Wrote: You are not allowed to view links. Register or Login to view. I've collected quite a few rainbows from alchemical texts, where they have symbolic meaning related to the color sequence of chemical transformations. They also show up in some of the old Mediterranean legends and were considered by northern cultures to be a bridge to other realms. But... I have also seen some "blowing fabric" on ancient vases and mosaics that look like rainbows and it's not clear whether they are meant to represent fabric, rainbows, or both and... sometimes when I look at the VMS "rainbows" I am reminded of the talit, as well as the scarves worn in Christian services (I don't know what they are called). Another source, with representations of rainbows that have been compared with the VMs, is Christine de Pizan's work, "Book of the Knight" - otherwise known as "Epitre de Othea" or "Epistle to Hector". Here the rainbow is a vehicle for various classical deities. I also see an apparent bit of 'divine interference' in the comparative example above, but the VMs rainbows are vacant. Perhaps they are just rainbows, though a vivid, double rainbow can certainly be inspiring. The colour schemes of rainbows are difficult to interpret over the centuries. I don't think there were any consensus on how many colours were present, or even a generalised idea that rainbows were made up of a set number of colours. In fact, even Newton - generally credited with being the first to understand and study rainbows- got it wrong by insisting there were eight colours (there are now considered to be only 7). He wanted a mystical association with his theory of the universe which involved everything coming in sets of eight. The chakra colors have been associated with rainbows, but I haven't found any evidence that this was so before the 19th century. Rainbow references to chakras appear to be recent. Augsburger Wunderzeichenbuch has an interesting "double rainbow" coming out of water, with the inner arc being white in color. Zakariya ibn Muhammad Qazwini created a 13th-century rainbow which is dark red, greenish, pink and grayish-teal. Sorry, I can't look up the references or hunt up files on my hard drive right now, I have to get back to work. I think it may be significant that what we see in the Voynich (if it really is a rainbow) is actually a double rainbow. I found an example of the type of apocalypse image I'd mentioned earlier. To me, the similarity is in the double nature of the rainbow, although of course, the Voynich rainbows have nobody sitting on them. Handy link, JKP. Hmm, those early rainbows are really all over the place. I'm surprised that they apparently only saw particular colors in them, often blues, yellows and greens. Some of them originate from clouds, but I haven't seen ones with those dangling lines like in the VM. You may be right that there's another typical synthesis or ambiguity going on here. You are not allowed to view links. Register or Login to view. I think the rainbows are rivers that connect to the sea, hence the blue and green, denoting both fresh and salt water, or highly mineralized waters inland. Top rainbow corresponds with river Guadalquivir, bottom rainbow corresponds to Guadalete, which delineated the Christian ruled territory and the Muslim ruled area of Granada (green area above in the south Spanish coast). You are not allowed to view links. Register or Login to view. The area of Almeria may match up with this portion, I believe the bucket indicates a bay, which is present, and the forked tube indicates rivers to me, again there are forked rivers in this area. However it may indicate other rivers further to the northeast as this area is still within the green of the portolan map, and the nymph is holding the tube high and to the right: You are not allowed to view links. Register or Login to view. The pointy bit drawn in the MS between these two parts of the diagram correspond to Cartagena. The main green area in the MS would represent the Gibraltar Strait & Alboran Sea. However the balance of the Atlantic Ocean, the area of Ceuta, and the Mediterranean at large are missing. 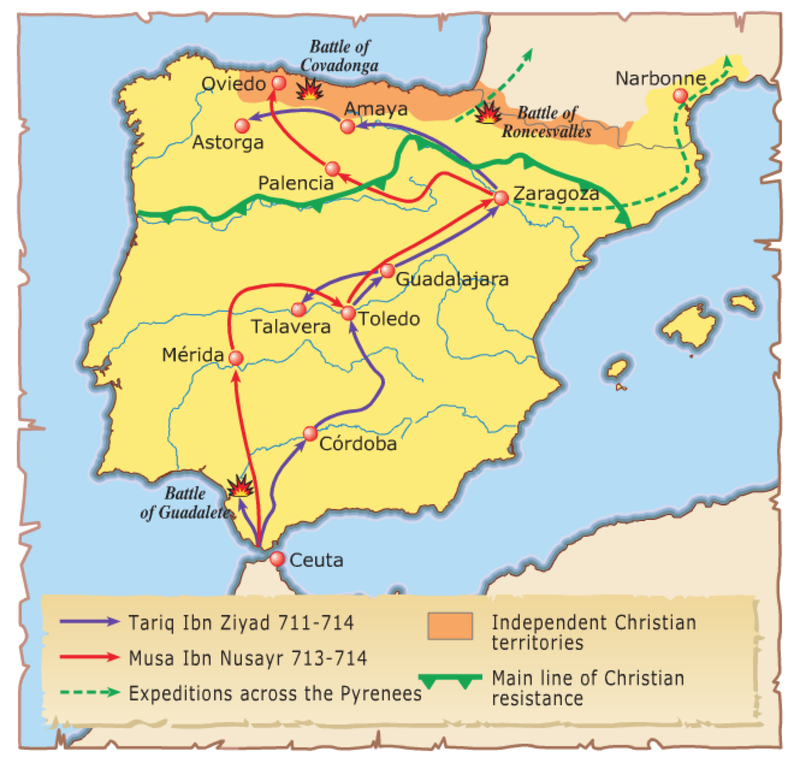 I think this may be purposeful as these areas are not relevant to an indication of overland routes in Spain, and have been covered elsewhere in the MS (imho), and their absence makes the diagram not immediately recognizable at a cursory glance if for instance enemy eyes should catch a glimpse. However the other bits match quite well, so that is my best hypothesis for the moment as to the meaning of this diagram. You can see below how the river to the east rises near both the sources of the "rainbow" rivers.